This recipe is super easy and delicious. Just blend chocolate and milk. Using chocolate instead of cocoa powder makes it richer, which I love. 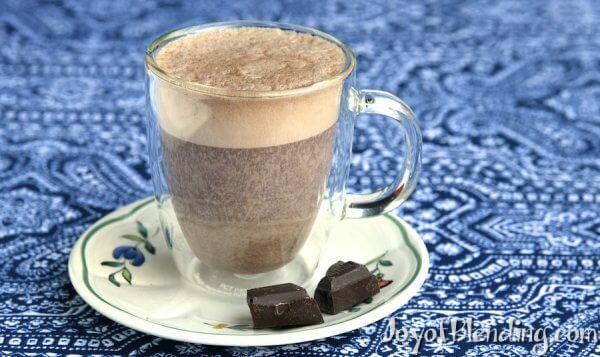 The advantages of using a blender are: you don’t have to chop the chocolate, you don’t have stir/whisk it, heating is even so it won’t burn or boil over, cleanup is easy, and it creates a nice froth. 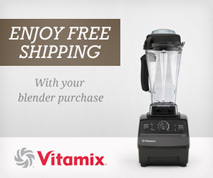 If you start with cold milk, you can heat it in the Vitamix by blending for ~6 minutes. Or you could preheat the milk and just blend for ~40 seconds. You can of course use whatever chocolate and milk you prefer. If you have super dark or unsweetened chocolate, you’ll probably want to add something to sweeten. You can also use cocoa powder instead of chocolate. It won’t be as rich, but you’ll still get a nice froth. Trader Joe’s Pound Plus 72% dark chocolate is perfect for this, and it’s what I’ve used to make hot chocolate in my Vitamix for years. It’s relabeled Belgian Callebaut chocolate and priced right. Looking more closely at your photo, I think TJ’s Pound Plus might be what you’re using!